In the last chapter we referred to the authoritarian impulse of Southern leaders and the ruling class in general. The party in power could handle the Southern opposition by using agents or party toughs. But the North- East was not amenable to such methods of control. As Southern leaders proceeded to exacerbate the ethnic problem from 1956, they became more nervous about the North-East slipping out of their control. In these circumstances, there was a strong temptation to suspend the Law and send in the hoodlums, in the futile hope that it would work. Such methods have been used by nearly all governments against trade union action in the South. The Sinhalese working class could of course hope for redress from a future government it would help to elect. But with a minority which was beginning to feel that the whole system was against them, these methods set off a reaction that was in its turn totalitarian and intolerant. Party, forcing him to run into Galle Face Hotel. The Police stayed away under instructions or were too demoralised to intervene. If this had been done to strikers or to the opposition in a rural Sinhalese area, the harm would have been minimal. But when done to the leaders of an electoral minority, it amounted to a collective insult. This in turn led to a closing of ranks among Tamil nationalists and, among the Tamils, violent sentiments and intolerance of dissent, with the ready evocation of the term ‘Traitor’. A potent element in the collective experience of Tamils is a deep sense of humiliation proceeding from the culture of the State. Those who have felt its cutting edge opine that it has played a greater role in the course of Tamil politics than the demand for rights. Even a man of such mild temperament as the Federal Party leader, Mr. S.J.V. Chelvanayakam, was moved to say privately, “A handful of cow dung thrown on Bandaranaike’s back would do far more good than volumes of reasoned argument”. That was a good 20 years before Tamil militant violence came to be seen as a problem. The book contains at the end a verbatim record of a secret discussion held at the Police HQ in mid-June 1958, to do a post-mortem on the ineffectiveness of the Police during the violence, with the Army having to be called in almost everywhere to restore order. The discussion took place around a list of questions prepared by C.C. Dissanayaka, D.I.G. Range One. Among the key questions posed were whether the ineffectiveness resulted from wobbly leadership and whether the Police were splitting up into racial, religious or other groups? It was pointed out that the Police had the same equipment as the Army and greater manpower, but it was the Army which was called out after the declaration of emergency, that proved effective. With regard to political interference S.G. de Zoysa, D.I.G. Range Two, put in some brave words: “In regard to orders by the Prime Minister, he said that if they were in conflict with fundamental principles of the Police, the Service should stand together and resolutely oppose them, and there was nothing for the officers to fear. He agreed with the I.G. (S.W.O. 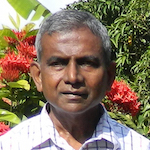 de Silva) that officers should not attach too much importance to events such as the transfer of an officer, appointment of a Commission, etc.” As to who was behind the violence S.A. Dissanayaka, D.I.G., C.I.D., declined to give an opinion, thus indicating who the main culprits were. A generation later, in 1983, the Police Force had by then far gone past the point of questioning itself about its failure to avert a major national catastrophe and then to restore order, in the event of one. The Police had by then become servants of politicians whose lack of restraint knew no bounds – a hint of which prospect is contained in the discussion quoted above. The Army too proved equally ineffective in the violence of July 1983. SWRD presided over the Race riots of 1958.He was a descendant of a South Indian by the name of Neelaperumal. JRJ presided over the Race riots of 1983.The family of JRJ were originally of Colombo Chetty stock.They assimilated later on,somewhere in the 15th/16th century with the main Sinhala line. Were both trying to prove themselves,to camouflage their de-facto origins? Did SJVC go with “a handful of cow dung” to negotiate on language policy? What was the sense in his approving of the unduly provocative “anti-Sri” campaign initiated by an inner circle without any plan, procedure or party approval? Moves towards communal riots by anti-Tamil racists stared from there, and the UNP had as much hand in the riots as SLFP. SWRDB willingly ignored the likely consequences of his indifference towards many issues. It was too late when he learned. But let us remember that the UNP was cynical all along, and Tamil leaders turned a blind eye to it all along until after helping the UNP to a massive majority in 1977. They woke up after the riots in 1977 and were lulled into slumber by false pledges negotiated by AJ Wilson, the ever loyal UNPer son-in-law of SJVC. They woke up to a rude shock in 1983 but have altogether forgotten the past. 1. Whether the DDCs had taxation powers. 2. Whether the DDCs had more powers than Municipal Councils? The person who asked the questions concluded by saying that the DDCs did not have power to even catch stray dogs ! They said no and were embarrassed. Amir and Wilson were shocked that there were people who can ask such heretical questions from them. The crest fallen Mr and Mrs. Amirthalingam then approached the questioner and asked him about his background and said that the DDCs were only a first step in a long process! Are you sure that it was 1978? I would have thought that it was a little later– after the new constitution and after JRJ punished Mrs B and FDB and the TULF had a brief flirtation with the Left. My memory and associated events indicate late 1978. Do you think it is a very good defense against what he did do? Do you think it is a very very good defense against what he did do? The District Development Council[DDC] Bill came into operation only in 1981 and the TULF made a puerile effort in trying to convince their voters to the effect that they have made considerable inroads towards a Federal state! District Ministers were appointed to chair the DDCs. Nelson to Trinco,U.B.Wijekoon to Jaffna etc. This was another of those insincere moves of the Govt:to cheat the Tamil people. Amirthalingam will also go down in History as having played ball! The powers of the DDCs could be written on the back of a 10cts stamp! Back of a 10 cent stamp? Plato, you must be joking. A wing of a housefly was a little too big. People carefully omit the facts that all the targeted attacks on Tamils happened between 1977 and 1994 UNP Regime and specially 1983 under JR’s auspices and conducted by JSS thugs; Yes the 1958 riots and a weak PM and the policy reversal from “Swabasha” to Sinhala only was also forced on him. JR marched to protest Swabasha. But it was still Swabasha that was implemented and Sinhalese and Tamils suffered because if you were Muslim or Burgher you got to study in the English medium even at elite schools like Royal College. In fact virtually every muslim at Royal studied in the English medium class and never in Tamil medium class. So SWRD was a disgraceful nationalist in anger at the way the British ruled Ceylon by favoring loyal minorities in every sphere. So his actions were reverse affirmative action to address lopsided issues. YET the way it was implemented was short sighted. No innocent tamils pogroms happened under CBK or Sirima for a reason. They were decent people. CBK actually even went a step better and deployed police to protect our evangelical churches from sinhala buddhist attacks and stonings. We appreciate that about her.